I did this painting this past week. 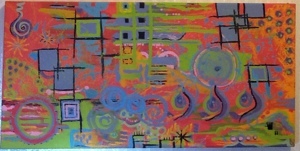 It is 12″ x 24″ and I am auctioning it off to support the Madison County Arts Council. I will donate 50% of the proceeds to the Arts Council, in support of Appalachian music and crafts. As of this moment, the price is $35.00. If you’d like to bid, please do so by leaving a comment on this blog post, or email me at mentalfarmer@gmail.com. Hope you like it and decide to bid! You may be underpricing your work…We’ll see how it goes! We like it, but we’re probably a little prejudiced. Good idea. Love, You know who.